Greetings, Temescal Canyon Association members. We are officially digital! This first Fall edition of our digital newsletter is being sent to all members who have given us their email addresses. The Fall 2018 Newsletter will also be posted on our website at https://temcanyon.org for easy access. If you wish to change or edit your email address, contact TCA at temcanyonassoc@gmail.com and we will make any necessary corrections. Email addresses are not shared. Being digital means we can update members on important issues, spend your dues more wisely, and make it easier for our volunteers to do their jobs. You will not be inundated with emails from TCA. Yes, it is time to renew your membership or begin a new one for you or a friend as a gift. Annual dues of $20 run from September 1 through August 31. TCA is a tax-exempt 501(c)(3) non-profit organization. Our volunteers need your support to sustain the quality of service that TCA has been providing since 1972. It’s easy. Just access our website at https://temcanyon.org and click on the DONATE tab at the top for directions on choosing your pay option. Follow the directions to renew membership, to pay dues, or to contribute. OR you can mail your dues/contribution to: TCA, PO Box 1101, Pacific Palisades, CA 90272. Please include your email address. TCA will continue working on preserving open space, building and maintaining trails for hikers and walkers, leading our 33-year-old free hiking program, and partnering with California State Parks. Please join us. Join Us, Renew Membership, Donate Here! 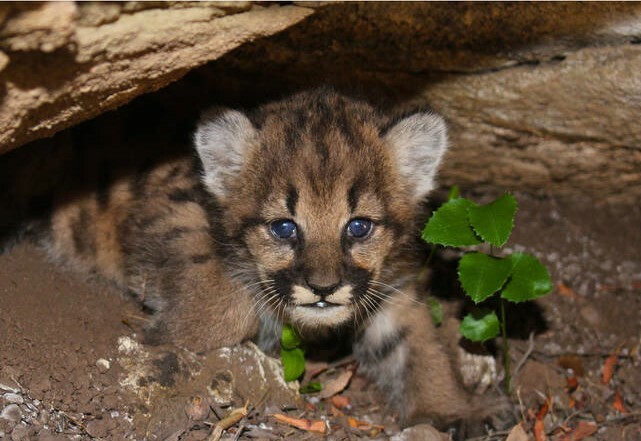 One of four mountain lion kittens, found in the Simi Hills. STOP and count to seven! 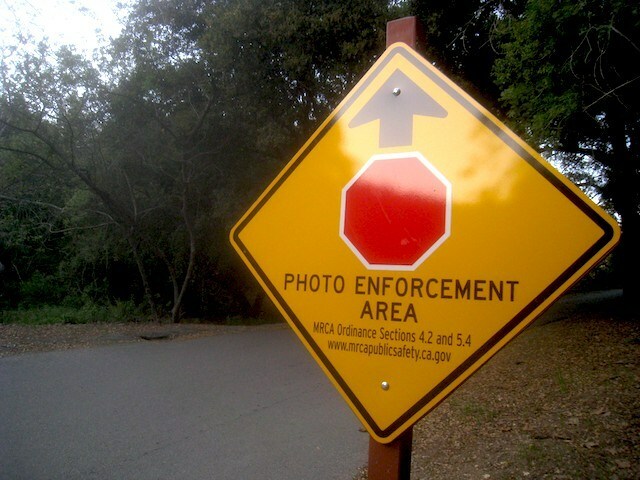 Controversial stop sign cameras are found in Temescal Canyon Gateway Park (2 cameras), Franklin Canyon Park (3 cameras), the scenic overlook at the top of Topanga Canyon (1 camera), and near the Marvin Braude Mulholland Gateway Park entrance (1 camera). Alleged violations are captured on video and in photos by automatic cameras. The fine that the Mountains Recreation Conservation Authority (MRCA) collects can exceed $100. Recommendation: complete a proper stop, count to seven, and proceed. Be safe. 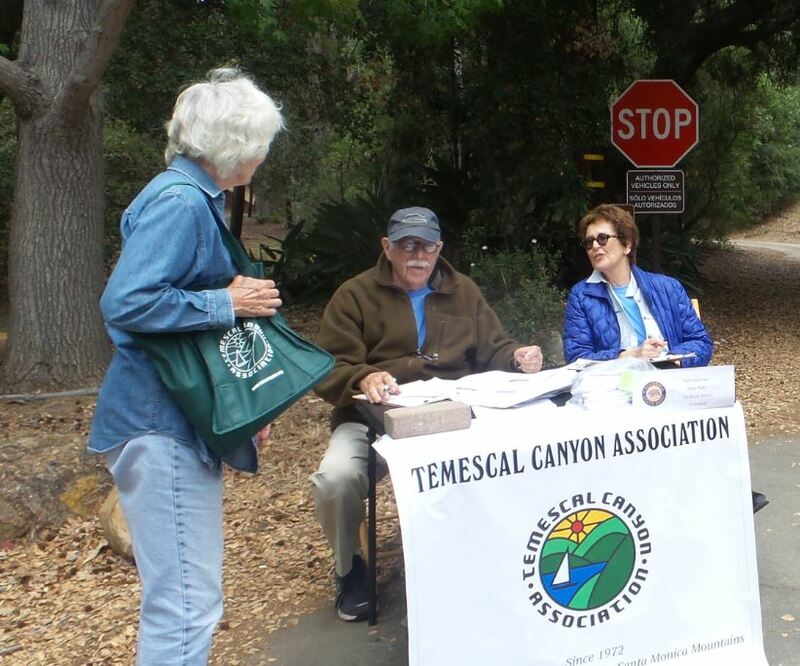 In June TCA Board Members set up a table in Temescal Gateway Park. Visitors were acquainted with TCA and invited to join. Also, TCA assisted the National Park Service in its trailhead visitor survey for their Interagency Trails Plan. It is apparent that our parks are heavily used by individuals and families from many areas, states, and even countries. We were pleased to assist the National Park Service in preparing to host the many, many park visitors of the future. In times of stress, there is nothing like a walk or hike in our mountains to lighten our spirits. California State Parks has plans to replace the beach access stairway at Point Dume. It was constructed between 1972 and 1980 and has been in dangerous disrepair for years. Dare we hope that the budgeted almost $2.9 million will actually make the stairway that we use to access the beach on our Point Dume hike safe once again? The staircase near the Point Dume Headlands will give surfers access to one of Malibu’s favorite surf spots, and maybe us, too. TCA’s annual meeting will be on Monday evening, December 3, at Stewart Hall in Temescal Gateway Park. Join us, as we will be updating our members with all the details as the date approaches. The public is invited so you can bring your friends to this free evening of entertainment. Come hike with us. It’s free. See the attached hike schedule and choose one or more that intrigue you. Bring a friend or neighbor. We meet in the Temescal Gateway parking lot at different starting times, depending on the hike. Most hikes will be only half a day and may include the option of a meal following. Carol Leacock has planned the new schedule that includes old favorites and new places to see. We meet in the second Temescal Gateway parking lot past the STOP sign near the Dining Hall. Wear boots or sturdy shoes. Bring snacks and water. Children with adults are welcome. Sorry, no dogs. Parking passes will be provided. This year we have shortened our Sunday hikes. For the most part they will be only half a day. Some will take place in the morning and some in early evening. Please note the different start times. Nov 4: We will take the trail up Red Rock Canyon to enjoy the view from Calabasas Peak. We meet at 9:00 a.m.
Dec 9: Tonight we will explore the Venice Canals in their Holiday glory and perhaps have dinner at one of the many near-by restaurants. For this hike we will meet at 5:00 p.m.
Jan 13: Once again our local historian, Randy Young, will lead us on a walk-and-talk through the history of the Palisades. We meet at 9:00 a.m..
Mar 10: Starting from the top of Mandeville we will take the Hollyhock Trail to the 1950’s Nike site on Mulholland then down the Garden Land Trail back to Mandeville. We meet at 9:00 a.m. This is a fairly short hike so expect to be back at Temescal about 1:30 p.m.
April, date TBD:. 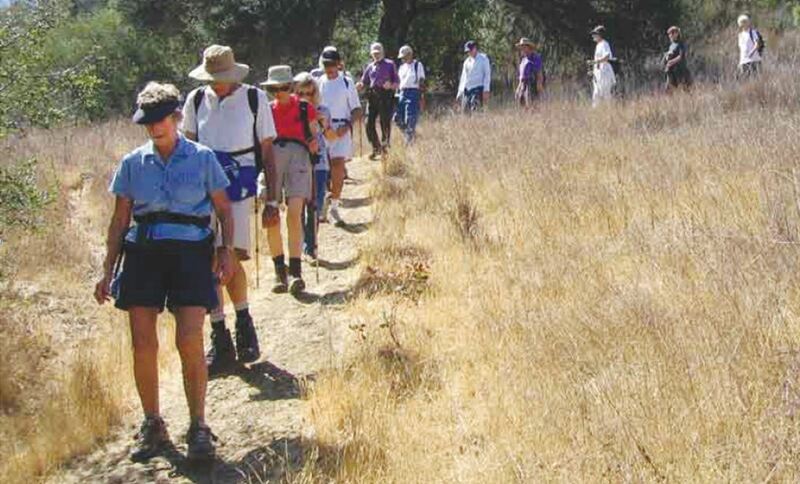 Rendezvous Hike—We will join the Sierra Club to observe John Muir’s 181st birthday at Trippet Ranch. Bring your own lunch. We will meet at 10:00 a.m.